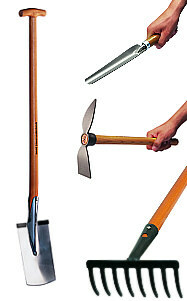 Our REX premium brand includes all devices necessary for gardening such as forks, rakes, hoes, shovels and spades in a design for "tool lovers". This product line has been designed for all gardeners who are committed to both the importance of technical quality and an appealing and aesthetic appearance of our devices. Concerning its steel and processing quality, its form and functionality, REX equipment does not differ from similar products manufactured in our company. However, what makes the difference is the way of dealing with the coloration. Consequently, a uniform appearance of the various devices is obtained and the quality of material is additionally emphasized. The dark blue-gray colour of the steel is indicative of the steel’s hardening and tempering. During the hardening process and the following tempering of the steel, the originally silvery color of the steel changes to a dark shade. The final finishing of our REX devices is achieved in two further steps. First, the spade blade is ground after the coloration and the blade edge is sharpened for easier entry into the soil. Finally, the blades are coated with clear lacquer for further protection against corrosion.